Most real estate investors rely on direct mail in a big way. While it's certainly not the only way to find great real estate deals, it's one of the most widely-used marketing mediums that delivers any kind of consistent, predictable results. In this episode, we talk with Brian Kurtz – an offline marketing expert (among many other things) who happens to know a lot about direct mail. While most of his past clients have not been real estate investors per se, there are many parallels and “best practices” that apply to everyone in the direct mail trade. 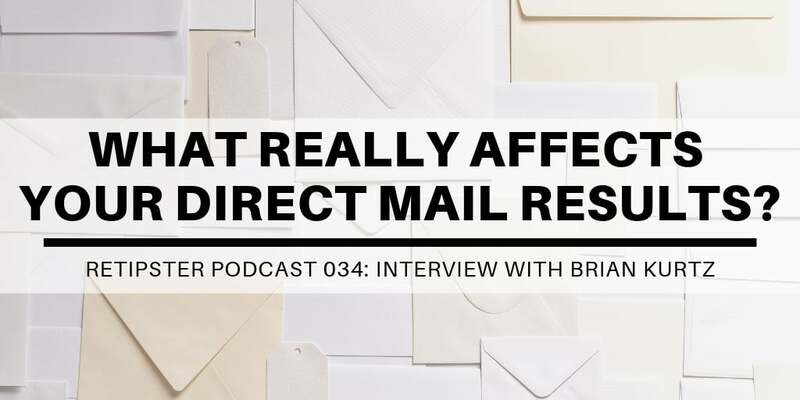 Brian shares with us some of his thoughts, opinions, and experience on how to get results with direct mail. Even though we didn't see eye-to-eye in every aspect of this conversation, I think you'll walk away with some new insights that are worth thinking about nonetheless. Leave a note in the comments section below. Leave an honest review on iTunes Your ratings and reviews really help (and I read each one). Thanks again for joining me this week. Until next time! Right-click here and “Save As” to download this episode to your computer. First of all, thank you for the podcast. This week’s episode, in particular, was interesting and I think it gave a lot of listeners something to chew on and ponder before sending out their next mailers. That said (and as you pointed out it in the episode), it was pretty clear Brian was confused at times as to how direct mail is used in land flipping — and for what purpose (buying vs selling — although they can be used for both). As a result, the conversation went down a few rabbit holes that didn’t appear so relevant. Also, maybe I somehow missed it, but I was under the impression that he woudl do a step-by-step critique on Jaren’s postcard. Although it was referenced a couple times, I don’t recall their being a specific criticism. (Was this part edited out of the episode? Just curious.) But it was helpful on your part to bring somebody in from the outside to discuss a component of our business (you get a bit more thinking outside the box that way). Finally, one of the things that I find interesting about land flipping is writing the copy for the offer letter, website, and ads. I’d love to hear you interview a copywriter in the future. Thank you for all the effort you put into your website, blog, and podcast — it’s high quality, and I think Jaren has been a great addition to your podcasts. Hi Neil! Thanks for the helpful feedback and questions. I can tell by your questions, you’re an astute listener. 🙂 This conversation definitely went down a few rabbit holes that I hadn’t intended, and you’re correct, Brian never did do an in-depth critique of Jaren’s postcard. I actually struggled with this conversation quite a bit, and with all the confusion and misunderstandings at the beginning, I thought about scrapping a huge portion of it altogether… but by the time we got to the end, I couldn’t deny that there was some strong value that came out of it… and I’m glad you saw it too. Great idea to interview a copywriter, by the way. We’ll have to look for someone like that so we can dig more into the copy of our mailers (that’s kind of what we were hoping for in this one, but we never got down to the specifics). Thanks again for listening! Great episode! I definitely have some things to thing about with my direct mailings. Is Jaren still going to post his postcard on this page? Thanks Joe! I’m glad you liked this one. I’m not sure where Jaren is at with this, I’ll have to check with him.